Volunteering in your community can be rewarding for many reasons — you get to help others, give back to your community and hopefully enjoy some personal growth along the way. Volunteering may help with professional growth as well – by gaining new experiences and meeting new people, you may just end up with a new job. Anyone who’s interested in taking charge of their career, whether they are currently employed or not, should volunteer.A It is perhaps one of the best kept career development secrets. Not only is it a great opportunity to network, but it’s a wonderful chance to learn how to motivate in a positive way, become a leader and fine-tune organizational skills. The fact that you are giving back to the community and going to feel good about it — that’s an amazing bonus too. It adds to your resume.A A volunteering stint is a great addition to your resume. It can help round out your experience and show that you not only have built professional skills but interpersonal ones as well. It can also help fill a gap in your resume– if you’ve been out of a job for a while, you can speak on how you took advantage of that time to help others in your community. It allows you to develop new skills or foster existing ones.A JimA A When volunteering, you’ll meet others, obtain new experiences and learn new job skills. Talk to theA volunteerA coordinators about what skills you have or you’d like to develop, and they’ll usually provide some training to get you off the ground. Even if the skills you learn don’t exactly transfer over to a potential job opportunity, it’ll show prospective employers that you are up for trying new things and taking on new challenges. It helps you meet new people and network.A Volunteering allows you to meet people you probably wouldn’t have otherwise met and expose you to others with different backgrounds and perspectives. When volunteering for or attending charityA eventsA orA fundraisers, strike up conversations with other volunteers or attendees. If appropriate, give out your contact information or ask for theirs. Sure, it might take you a bit out of your comfort zone, but you never know where it might lead. Be strategic about where you volunteer.A A Want to work in public relations? 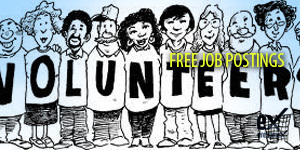 Volunteer at a public relations trade organization or offer to handle the publicity for a charity event. Choosing an association or volunteer role that matches up with your background will not only help you hone your skills, but it’ll also allow you to meet people in that particular industry. It’s also important to be passionate about and interested in the cause for which you’re volunteering. That enthusiasm will show when asked about it during a job interview. Check out sites such asA Get Involved!A andA Volunteer Match; these sites can match you up with opportunities based on your interests. Don’t make it all about the job search.A While volunteering can help connect you to new people and potential career opportunities, it shouldn’t be the sole reason why you choose to give back. If you go into it purely thinking about what’s in it for you, not only will you lose out on the sense of accomplishment and enrichment it can bring, but others will likely see right through your intentions, which could cause a potential negative reaction. Treat everyone you meet as a potential influencer or employer.A TreatA everyone you volunteer with, or for, with respect. Always strive to be professional, reliable, effective and courteous. You never know who someone knows, and their impression of you, good or bad, can become an asset and create new possibilities as they share their experience of you with others. Conversely, if they share a negative view of you with others, it could come back to bite you. So if you’re out of a job, or even have a job but want to expand your horizons, consider volunteering. Who knows where it might lead – both personally and professionally?